The Apostle Paul argued daily in the market place, and preached the gospel of Christ. Therefore disputed he in the synagogue with the Jews, and with the devout persons, and in the market daily with them that met with him. Acts 17:17. He spoke at Mars Hill and disputed with the intellectuals of Athens. But we don’t need a Mars Hill when we have a market place where people gather. 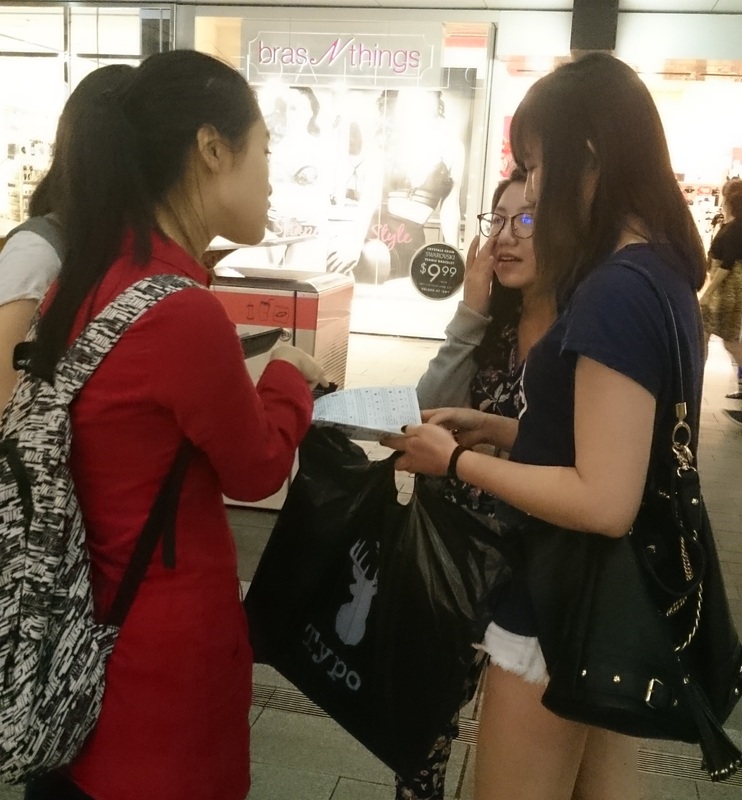 Last night we went to Rundle Mall in the main shopping district of downtown Adelaide and spent hours presenting the gospel message to many. Especially we spoke to young students. I had Sunny and Shuman (shown below) with me, who are both from China, and we presented the gospel message to Chinese students using the Real History in Chinese Script tract. 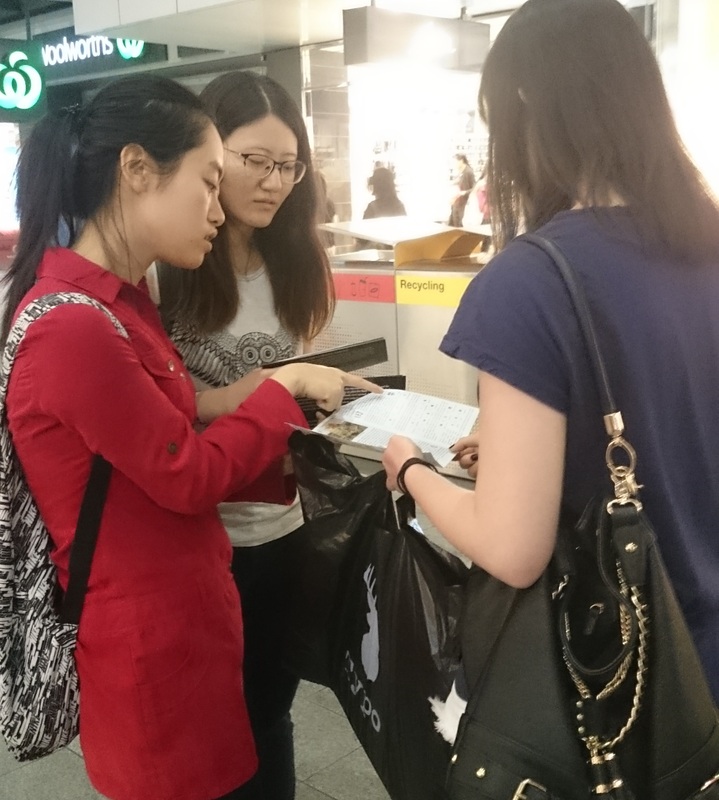 Many showed a great interest in the message presented. One-on-one, or, as it was last night, two or three on two or three, is an effective and efficient way of sharing the essential truths of the gospel. The time has passed where we might say we never knew. God will no longer overlook our ignorance. He now commands all men everywhere to repent and turn their hearts and minds to God. To seek Him! And if you trust in Him, He will give you His righteousness. Christ is the Lamb of God; the ultimate and perfect sacrifice Who paid the debt we owed God for our sins. This is illustrated in the Chinese word for “righteousness,” made from a combination of the words for “me” and “Lamb.” Now, there is coming a day when God, through Christ, will judge the world wherein those who trust in Him will be saved. Call on God! Seek Him! And God, through the Apostle Paul, said that He “…has given assurance to all men, in that He has raised Him [Jesus Christ] from the dead.” (Acts 17:31) Thus we know when we are saved. This is not science nor religion but real life in Christ. 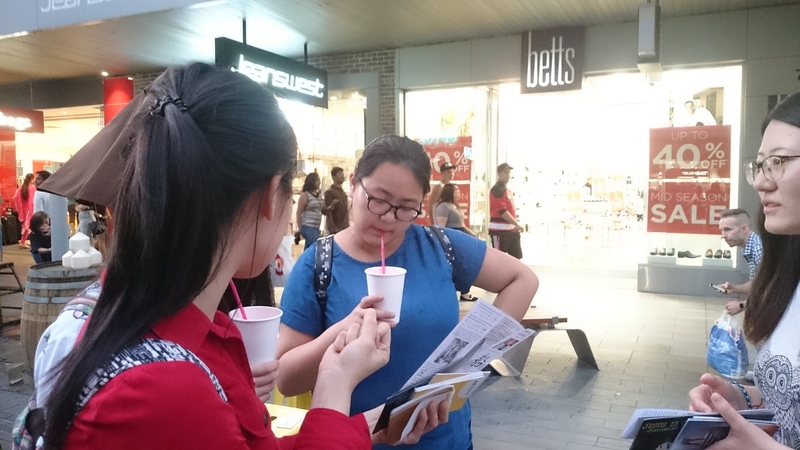 This entry was posted in Testimonies, Witnessing and tagged Adelaide, evangelism, Jesus Christ, John Hartnett, righteousness, Rundle Mall, witnessing. Bookmark the permalink. Nice work! Very inspiring! God bless you and make you fruitful. Haha. I don’t know when I was taken pictures. Suzan, Thanks for your encouragement! Yes, I do have a few YouTube videos. See the dropdown menu “YouTube Videos” on BibleScienceForum.com for some on science or go to my YouTube channel and scroll down and you’ll find some by me. My own testimony may be found on 3 YouTube videos listed here.